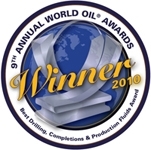 World Oil Innovation Award | Newpark Resources Inc.
HOUSTON, TX (October 29, 2010) — At the 9th Annual World Oil Innovation Awards, Newpark Drilling Fluids garnered industry-wide recognition for its cutting-edge technology, winning the award for Best Drilling, Completions & Production Fluids with its Evolution™ drilling fluid system. Newpark was selected over Halliburton, Baker Hughes, M-I SWACO and China National Petroleum Corp.
Heralded as one of the industry’s most prestigious and coveted honors, World Oil convenes a panel of leading academics and executives each year to recognize innovative technologies and companies shaping the global future of the upstream oil and gas industry. Originally conceived as a Haynesville-specific drilling fluid solution, the Evolution system provides operators in emerging unconventional resource plays worldwide with a clean, yet robust alternative to the oil-based fluids historically required in harsh drilling environments. The World Oil Awards—hosted by World Oil magazine, a leading oil and gas trade journal for the exploration, drilling and production sector—cover all aspects of the upstream industry. The program, now in its ninth year, benefits leading universities that provide education for careers in the petroleum industry.